Nosler Trophy Grade ammunition is world renowned for its ability to provide accurate, devastating performance on your next hunt. These .243 Winchester rounds from Nosler feature a 90-grain AccuBond projectile, loaded into boxer-primed, noncorrosive reloadable brass cases and are ideal for elk, deer and other similarly sized game. The AccuBond projectile features a polymer tip inside of a tapered copper alloy jacket, allowing for maximal weight retention, while utilizing Solid Base technology at the rear of the bullet as a base to optimize expansion. The AccuBond projectile also goes through a proprietary bonding process to prevent any jacket and core separation. 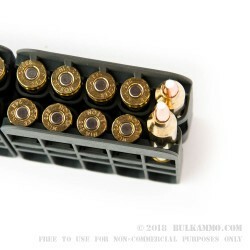 These .243 Winchester rounds are capable of a muzzle velocity of 3100 FPS and maintain a velocity of 1942 FPS at 500 yards, making them highly effective long-range hunting round. 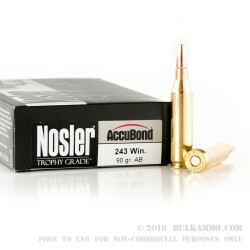 Each box of Nosler .243 Winchester contains 20 rounds. Since 1948, Nosler has created quality hunting ammunition for hunters and match shooters. From their Solid Base line to the Customer Competition, line Nosler has a round for the job.